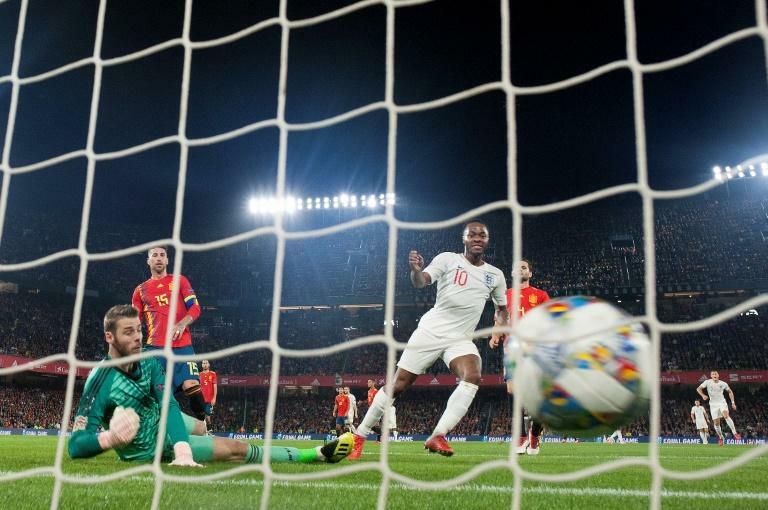 After an electric first half that had witnessed three slick breakaway goals, England were creaking, as Paco Alcacer headed in for 3-1 and Jordan Pickford almost gifted Rodrigo a second. On the touchline, Southgate stayed arms folded, making one change before the 85th minute, and that came in the 76th, Kyle Walker replacing a weary Ross Barkley. Perhaps he believed England could hold on. Perhaps there was merit in giving these players the chance to do it too. After all, they had reached the World Cup semi-finals, but with the advantage of a fortuitous draw. When Croatia and Belgium, twice, came calling, England came up short. Now they have handed Spain their first competitive defeat at home for 15 years, scoring three times in the first half against a team rejuvenated under a new coach in Luis Enrique. It was only a month ago Spain had obliterated Croatia 6-0 and, despite the 2-1 scoreline, outplayed England at Wembley too. "It's a beautiful feeling," said Raheem Sterling, who scored twice, along with another from Marcus Rashford. "It was a brilliant team performance." For Sterling, who had not scored for England since October 2015, and Rashford, who missed a couple of glorious chances in the goalless draw against Croatia, these were confidence-building goals. England's third attacker, Harry Kane, who has been fending off criticism that his form has dipped since winning the World Cup golden boot set up two goals. "People always talk about goals and if I don't score I don't play well. But I've contributed to the team and that's important to me," Kane said. "I love scoring goals but winning feels even better." 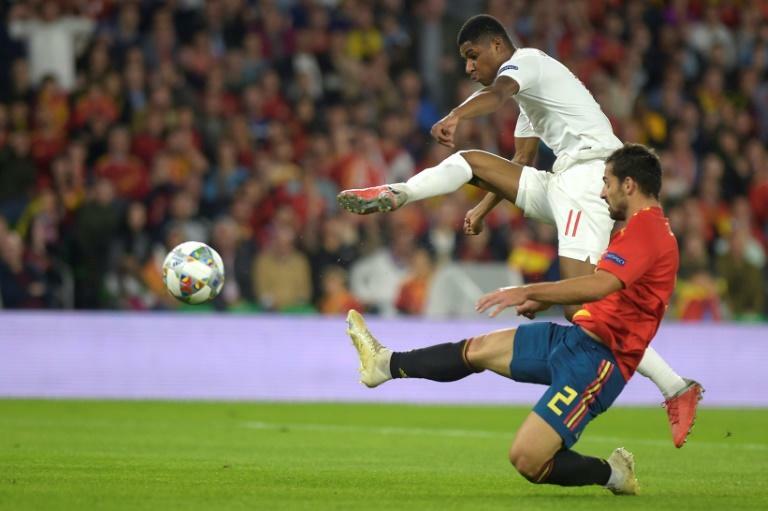 When the whistle blew after a breathless 98 minutes at the Estadio Benito Villamarin, the talk was of England's most impressive victory since they beat Germany 5-1 in Munich in 2001. There was the shoot-out triumph against Colombia and the summer stroll over Sweden to go within a game of the World Cup final. They have seen off Germany, France and Brazil as well in friendlies. But in terms of a competitive match, you have to go back 16 years to Sapporo, and David Beckham's penalty against Argentina, for England's last win against a World Cup winner. This was not a World Cup, nor even a European Championship, and Southgate will not pretend the surprisingly compelling Nations League is as competitive as either. But Spain were desperate to win. When Pickford scrambled the ball off Rodrigo, Spain's players harangued the referee for a penalty. When Sergio Ramos headed home in the 98th minute, they sprinted back to the centre circle, in the hope of one final attack. England held on, another injection of belief gained for a team that had an average age of just over 23, their youngest since the turn of the century. "With a lot of young players, it's important they have good experiences, that they enjoy playing for England and feel the way we want to play," Southgate said. "They should be able to progress from this, it's up to us now." They could now even win Group 4 if they beat Croatia at home next month but Southgate will know there is work to be done. England's sense of panic in the second half in Seville was reminiscent of their frenzied play under pressure against Croatia in Russia. Pickford, the instigator of two goals scored, could then have caused two conceded, fumbling for the corner that Alcacer turned in and then overplaying against Rodrigo. "He's got the technical ability to find passes into midfield, although maybe not to do a Cruyff turn in his own box," Southgate said with a smile. "It's something to work on." Individually, Harry Winks plugged a playmaking gap in midfield while Harry Kane, Rashford and Sterling found their finishing touch up front. Joe Gomez, Liverpool's talented 21-year-old, was assured in central defence. Most of all, England discovered how it feels to beat one of the best. "It is good to come to places like this for the young lads," said Kieran Trippier, England's oldest player at 28 until Walker, who is also 28 but three months older, came on. "You want to play against the best and we want to be the number one team. It was a great night and now we have to move forward."